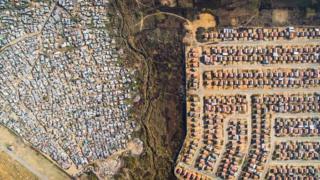 Aerial images by drone photographer Johnny Miller reveal the dramatic divide between rich and poor in cities in South Africa, Mexico and India. 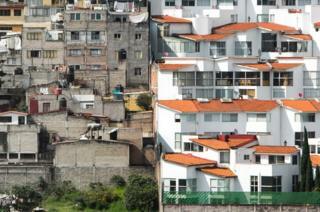 Image caption Santa Fe, Mexico City. 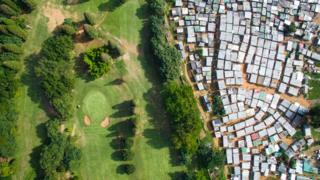 The photos are part of Mr Miller's Unequal Scenes project, which he started in April 2016 to challenge people's acceptance of inequality. 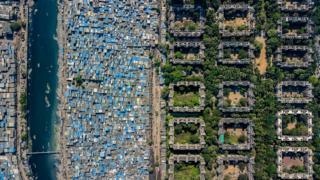 The South African-based photographer says: "From the minute you land in Cape Town, you are surrounded by shacks. 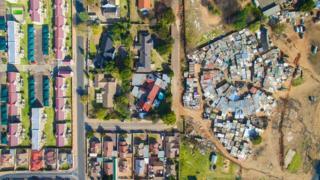 "Literally, tin shacks surround the airport, which you have to drive past for about 10 minutes, until you reach the more affluent suburbs where privileged people (myself included) live." 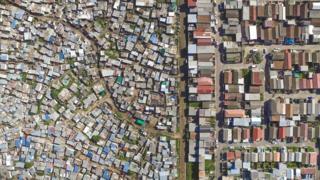 Image caption Vukuzenzele, Sweet Home, Cape Town. Mr Miller continues: "This is the status quo in Cape Town, in South Africa, and in many parts of the world - but that's a status quo that I'm not OK with. "To paraphrase Barack Obama, I believe that inequality is the defining challenge of this generation." Image caption Casey Park, Johannesburg. 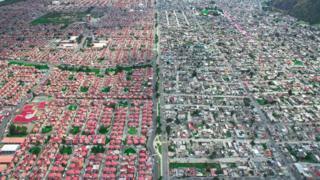 The overhead angle, known as "nadir view", reveals borders made up of fences, roads or wetlands between rich and poor. 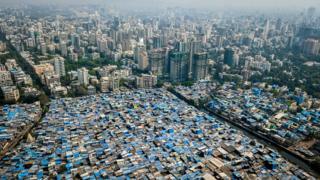 On one side lie poor housing and on the other affluent homes and mansions. Image caption Papwa Sewgolum Golf Course, Durban. Image caption Ixtapaluca, Mexico City. Finding the best places to shoot drone photography takes Mr Miller a lot of research. 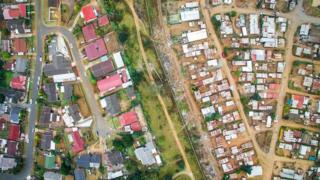 "I identify where to take the photographs through a variety of tools ... a combination of census data, maps, news reports, and talking to people. 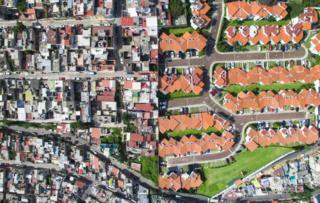 "Once I identify the areas I want to photograph, I visualize them on Google Earth, and try to map out a flight plan. This includes taking into account air law, air safety, personal safety, battery life, range, weather, angle, time of day, and many more factors." 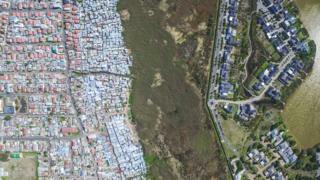 Image caption Lake Michelle, Masiphumelele, Cape Town. Image caption Otto's Bluff, Pietermaritzburg. 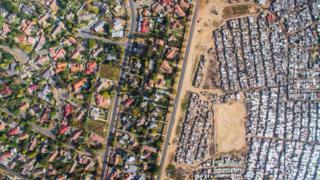 Image caption Kya Sands, Bloubosrand. All photos by Johnny Miller.